Working on a wounded German officer in Italy. Doc Alexander is at the back wearing a beret and goggles. The following was written by my father and Doc Alexander’s youngest son, Bob Alexander, when Doc Alexander was named in 2005 as one of Alberta’s top 100 physicians. As a child, all I knew of my father was through the talk of others, my mother and brothers and sister, his friends, old patients and nurses, and those who knew him before the war. Strangely marked, censored letters would arrive, and my brother would save them and the telegrams and the newspaper clips pasting them carefully into huge scrapbooks. I learned about the Calgary Tanks and the 8th Field Dressing Station (FDS). The invasion of Italy and Dieppe and the liberation of Holland. I heard he was wounded, then missing, then found after the Dieppe Raid, and in the night, my brother shouting that our Dad had been decorated for bravery by King George. I saw pictures of this man, whom I didn’t remember seeing, treating wounded soldiers, designing jeep ambulances, operating on a German soldier, and standing at attention for inspection by General Montgomery. Then I heard: He was coming home. The Hudson’s Bay Company. They went all out to welcome him. Our house was covered in bunting and welcome homes signs made by the HBC staff and the walks were lined with candles. That day the family and friends stood by the railway crossing near Mewata Barracks waiting for the train and our Dad and husband. I was terrified. Who was this man, this bigger than life “hero” who was about to come into my life? Dad was born in 1898, in Fredericton Junction New Brunswick, taking his public schooling there, and winning a Governor General’s medal for academic achievement. His brother was practising medicine in Saskatoon and Dad followed him to the University of Saskatchewan for his Arts degree. 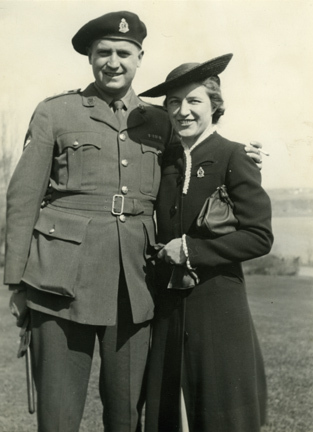 The First World War was looming and Dad showed a sense of responsibility that never wavered throughout his life by joining the Canadian Army as a very young man. Perhaps it was there, in the trenches of Europe, that he learned compassion and care for the individual of any stripe while acting as a stretcher bearer in the midst of the horror Though badly gassed he remained at the front for the duration of the war. No man was better suited for medicine than he. He sincerely loved people and ached with that love openly, fiercely determined to defend the dignity of those he tried so hard to help. He had an uncanny ability to see and bring out the very best of any one he encountered. I’m sure also that it was a combination of these qualities and his war experience that influenced his decision to become a doctor. Upon his return he obtained his medical degree from the University of Manitoba,paying his fees in part by coal stoking people’s furnaces in the early mornings. He also met again Muriel Freeman who was teaching school in Winnipeg, but whom he knew in Saskatoon. They were married and returned to Saskatoon and Dad began his practice with his brother. Soon the desire to be independent grew and they moved to rural Alberta to begin a country practice in Arrowwood, Alberta. Two of their four children were born while in Arrowwood. The ties they developed there remained. Ever after Dad maintained a large rural practice. It was eventually clear that a move to Calgary was necessary and Dad began his practice in Calgary associated with the Holy Cross, General and Grace Hospitals. It was during this period that he established a long-term relationship with the Hudson’s Bay Company, and a later taking on the responsibility of providing medical care to the people of the Stoney-Nakoda First Nation, west of Calgary. Almost immediately a small hospital was established staffed with two full time nurses. Dad would drive to Morley every Thursday for a clinic. And quickly became respected and honoured by the Stoney. In turn he cared for them deeply, and anguished over their difficulties. He did everything in his power to improve their welfare and spent untold extra hours working for their behalf. He truly acted as a bridge between the two cultures and is remembered fondly to this day by the native Elders. During this period he became associated with the Calgary Stampeders hockey team in the old Western League. He reveled in the victories and defeats of the team and valued every member passionately. As the team Doctor he attended every home game caring for the players before and after every game and then checking into the oppositions welfare..
His medical practice was growing and he was becoming well established. Two more children arrived as did the Second World War. He knew he didn’t have to enlist, but he also knew a duty and a need, particularly for medical personnel. In 1941, he left Calgary with the Calgary Tank Regiment , more prepared than most for the terrible time ahead. He was not a wealthy man, but he gave what he had, his skill and training and his love for the soldiers from Albert. Could there be a greater gift? He participated in the front lines of the invasion of Sicily and Italy, was wounded; and the dreadful event of Dieppe,where we were told he was captured, then found, then decorated by King George for bravery. He was decorated again for his command of a medical unit and his innovative use of Jeeps, turning them into ambulances. He was directly involved in the liberation of Belgium and Holland. And in 1945 he came home. He came home to no office and no practice. Once again he started from nothing only to have his office burn down within a few weeks of his return. He worked steadily, very quickly building his practice until it became one of the largest in the city. His work load was huge; surgery in the morning, office in the afternoon, home usually by 6 p.m., and then house calls (seldom fewer than two and frequently four). The weekends were hospital rounds on Saturday and Sunday, mixed in with maternity’s and emergencies. In spite of this he continued his work with hockey (now a semi-professional league), the Stoney at Morley and the Hudson’s Bay. Though the demands on him were tremendous somehow he found a way to be a father and husband with his remarkable talent of understanding and sensing the needs of all of us as separate individuals. He never lost his rollicking sense of humour and good cheer, making his family, friends and patients lives brighter when ever he was around. He was invited by the Calgary Exhibition and Stampede Board to become a director, responsible for medical services for all activities involving Stampede facilities. That included hockey, wrestling, agricultural and skating shows, and of course the Calgary Stampede itself. Not only did that include all participants but all the attendees to the events. He drew on his military experience to design and operate an outstanding organization of medical posts throughout the facility and a sophisticated communication system ensuring immediate medical attention. He utilized the excellent trained resources of St. John Ambulance personnel to produce an excellent medical service for all events throughout the year. Like everything else he did, this was approached with the utmost of professionalism and dedication. He died of a massive heart attack on April 27, 1967 at age 69 while looking after the welfare of young student’s at their science fair. What did he contribute to Alberta as a medical doctor? 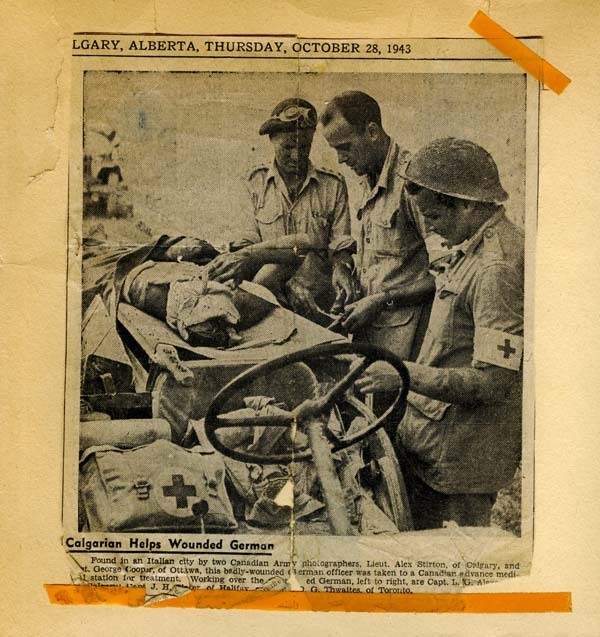 He administered to thousands of Albertans, he cared for and doctored to our Alberta soldiers under conditions of war, saving hundreds and probably thousands of Albertan lives, and represented the medical community in the Military with distinction and honour. He worked for the welfare and good health of our Indians and initiated programs of medical care for the growing public events in Alberta. Most importantly he gave of himself to every individual and responsibility that came his way. To say that as a family we are proud of him is obvious. It was our honour and great privilege to share him with so many and to learn that his absences from us, only meant that more and more were benefiting from this remarkable and unselfish man.